Perfect for the sports tournament season, the Soccer Ball Football Ice Mold is a stunning sports version of the classic ice sphere creator. Guests at home or your customers will be dazzled by these spheres in the instantly recognizable shape of a soccer ball. 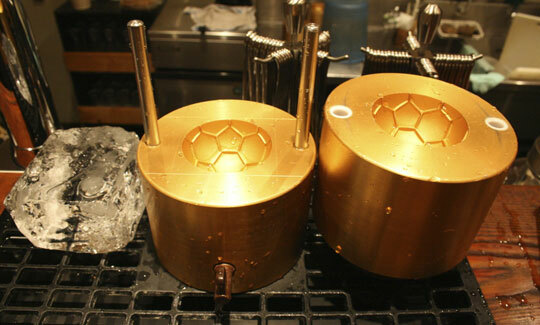 The aluminum in the mold is amazingly conductive and creates professional ice balls that will look great for having with drinks during soccer matches. 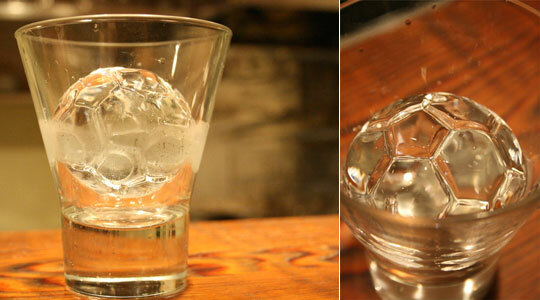 It's not just aesthetic, though: these special ice balls melt more slowly, keeping your drink cooler for longer. Making ice balls with these molds is super easy: Simply heat briefly in hot water, place good-quality ice in the mold, put on the top, and it works on its own! Of course, for larger molds so it does take a few seconds more. However, when the results are this good we think it's worth the extra wait. 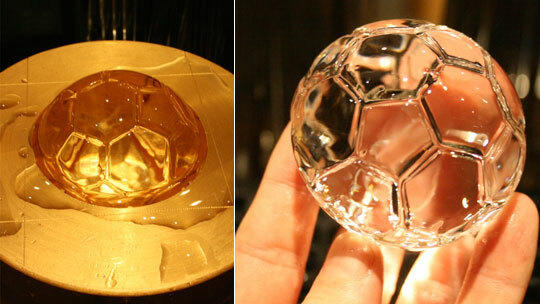 Like the regular ice sphere molds, the Soccer Ball/Football mold is available in several sizes: "mini" 30mm, 55mm, 65mm, and 70mm.